It’s refreshing talking about Toyota without mentioning their recall nightmare. Okay, that was one mention. The new Sienna minivan campaign just launched and it is providing some decent ways for a brand to leverage their online properties to further promote an attempt at a viral video campaign. The videos are cutesy comical takes on parenting and mocking the “look at me” parents who are all about style and self-congratulatory recognition. Actors Brian Huskey and Rachel Drummond play the part well. The ads are well done for what they are; though, some wonder if the timing of this campaign couldn’t be worse. Toyota is trying really hard to get people to think of Toyota beyond just the recall as they heavily market their brand and the Sienna during the Olympics. I’m not sure I agree. Toyota still has to promote its new products even with a major recall. Sure the Sienna stuff is tongue-and-cheek at a time when the company needs to be very stiff and serious, but the Sienna campaign was in development long before the recent recall news and the work does fit well in the minivan segment. Let’s face it anyone buying a minivan has already given up on being cool and probably feels smart choosing a minivan over pricier, less practical SUVs and CUVs that dominate the driveways of most families. So what better way to endear yourself to your buyers by making fun of the superiority of style conscious sport utility parents by applying that attitude to minivan drivers? Also, taking a few liberties with the “fun” of parenting is not a bad thing either. This is not a new concept for the Toyota Sienna. Sienna’s last effort in 2007 included ads that ran on a similar theme, but slightly reversed. Instead of the parents mocking the kids, the kids mock the parents as in this commercial featuring some ungrateful kids whose new playhouse doesn’t feature leather seating surfaces like their comfy new minivan. What I like best about the campaign is not the witty writing of the commercials; rather, the digital connection of various web properties is well executed by the online team. The campaign is made available through a branded YouTube channel that also promotes connecting to the vehicle’s Facebook fan page and links out to more information at the Toyota website. 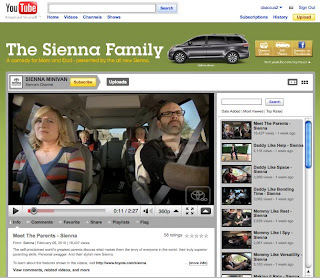 Unlike most auto manufacturer shopping sites, the Sienna vehicle page clearly connects to the campaign and promotes the accompanying social websites; though, the call to action to “watch more Sienna commercials” on YouTube is less than exciting on a vehicle’s landing page. It’s a bit we really love our ads now go watch them and see how smart we are. Even so, the vehicle-landing page communicates clearly and connects with the campaign in an uncluttered way while promoting a connection with the brand in social media. I really like how the communication happens across Toyota’s site, their Facebook fan page, and the YouTube channel. It is all nicely integrated and finds a way to bring the whole effort together even if it is distributed across the web. The online flow isn’t revolutionary. It’s simple, not overdone like Sienna's “Making It Rain” ad.